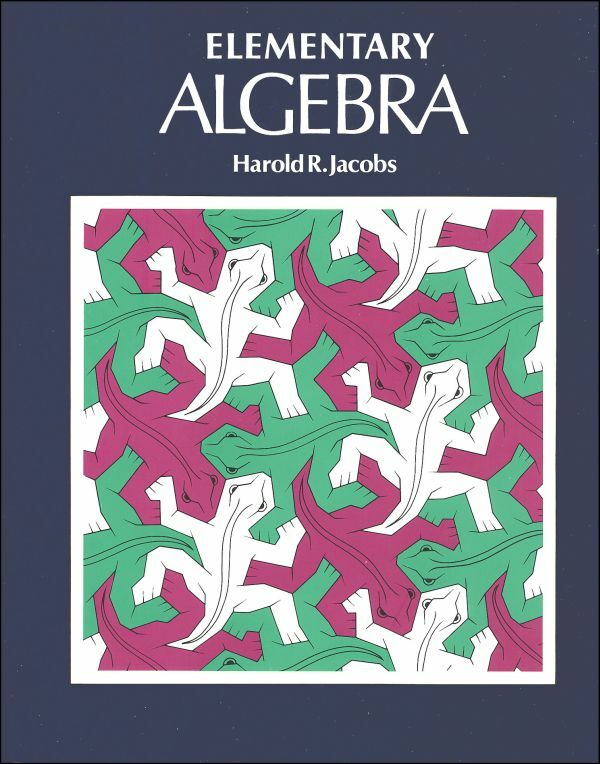 The Textbook: Harold Jacobs Elementary Algebra: This text is well thought out and thorough. It is the best high school algebra text I looked at, especially if you have a child who might be taking advanced math classes, such as calculus, in the future. Math is a strong suit of mine though, so I am not sure it is the right course for a parent who is not strong in math. The Algebra Course we are using for 9th grade. My son always felt that he was bad at math until this year. Math has been the source of so much frustration for the two of us! I could see that he was good at the high level thinking side of math. Where my son struggles is the simple arithmetic side. He also struggles with spelling, but not the rest of language arts. I bet there is a connection between these two, spelling and arithmetic. Maybe they use a similar cognitive path? We have worked long and hard again and again on simple math facts. They just do not stick with him. This summer (2014) we used the on-line program CTC Math, and that helped with this more than anything else we tried, but it did not entirely solve the problem. (If math is not your strong suit, give CTC a look. We liked it. My son loved the Australian accent.) We moved to Elementary Algebra in September, 2014 because Sean needs help from me in math. I find it much easier to give help if there is a text we can both refer to. I have yet to see an on-line course that makes it easy for the parent/teacher to refer to or use when the student needs additional help. FYI, overall I am not a fan of on-line only programs. Don’t let my bias affect you though if you like them. All went very well, except for the occasional calculational issue. They were better, but still a source of frustration. I was at a park day and started up a conversation with a person who runs homeschool math co-ops and tutors math. I told this story to her and she said she sees this with homeschooled kids sometimes. She gave me the advice that turned math around for us. She suggested I buy Sean a good calculator, one he could still use in college, and have him use it for calculations! The SAT allows calculators, so why not! Overnight, using a calculator, Sean began acing math tests and homework sets! I am a bit conflicted about math (even though it was and still is my absolute favorite subject). I think math is taught to the detriment of other subjects because it is the most easily testable subject, and that bothers me. There are only so many hours in the day, and I truly believe there should be less time spent on math and more time spent on learning the craft of writing, learning how the natural and physical world works (AKA science), and computer science. I have voiced this to several friends who work in the public school system and they agree with this assessment. But if you think your child might go to college, especially if they are interested in computer coding or science, including medicine, make sure they get the math they need. When I was attending and then teaching college there were two disciplines I observed that weeded students out, keeping some people from realizing their dreams of an intended career. They were math and chemistry! I actually had a friend who was a theater major at San Diego State who ended up dropping out without her degree because she could not pass her math classes. A year of college algebra was the only thing that kept her from obtaining her bachelor’s degree. I would love to speak with you. I need help. My son is in 10th grade and is not being educated due to illness and the “district” is unable or unwilling to help him. If possible, do you ever call and help people like me. I am scared. Thanks, Patty 951-445-9033….my son is named Sean also. I am sorry it took me so long to reply. I was busy with visiting family. I can tell that you are very worried. I cannot give the specific advice I think you are looking for. Are you thinking of homeschooling your son? I have no input to give about working with your school district. I am not against traditional school in any way, but we have been out of that system for a long time. As you can probably tell from my posts, I do think parents can handcraft an education that is superior for your child to what they could get at a traditional school. The purpose of this series of blog posts is to show you how one person, me, has been handcrafting the education of one person. In order to handcraft the education for another person you have to know that person very well. Each ingredient is thoughtfully chosen. Some are thrown out because they do not work well for us, others are tweaked so they work better for us, and others are perfect just as they are. In the blog posts, I give my reasons for the path we are on, but you have to remember the course would look much different for the handcrafted education of a different child. Our 12 year old struggles with math facts, too — uses touch math for adding and subtracting. But multiply and divide I’m not sure he’ll ever be able to do in from memory. Should I worry or just ‘give him a calculator’ and stop drilling him? He wants to be an EMT so basic decimals and simple algebra are in our future…should I ditch paper and pen right now??? Will all the tests he has to take to become an EMT allow him to use a calculator? If so, why not move over to a calculator. I am sure some math purists would be horrified, but with the use of a calculator, we have been able to focus on the complex math tasks and leave the drilling and simple calculational struggles behind. I would suggest (this is what the math teacher suggested actually) that you find the calculator he will most likely use for the test to become an EMT. That way he will be really good at doing math with that calculator. If your son is like mine he will also go from hating math and thinking he is bad at it, all because he cannot remember 7 x 4 is 28, to realizing he is good at it when the simple calculations are taken out of the equation. (Math pun intended 😉 When my son started using a calculator he slowed down for a bit completing his assignments as he became accustomed to using it. Thank you. 🙂 I know he may change his mind of the EMT but it’s a nice focus right now. 🙂 I do think in or state you are NOT allowed to use a calculator in the exam but I still wonder if, right now, taking the stress out of the picture and allowing him, as you have shown, to see he’s actually good/capable at math, when the time comes, he’ll WANT and feel confident about learning what he needs to know to do what he loves. But if it just stays stressful, I’m afraid he’ll shy away from it because he’s convinced he can’t. A little bit of psychology but I don’t discount that at all! And it feels like a calculator will help him find his confidence and trust in his ability to learn it. If he finds he has to memorize some stuff later, he’ll have a core believe that he can do it. Does that make sense??? That makes so much sense! My son actually told someone over the holidays math is his best subject!!! 3 months ago he was bad at math (in his opinion, not mine), and now he thinks it is his best subject! All because he uses a calculator of simple calculations so he can focus on the big concepts. I wish someone had suggested the calculator a couple of years ago.